: Magical Strands Boutique - Alpaca product and service supplier located in Terrebonne, OR owned by Nancy Chapel-Izer and Art Izer. 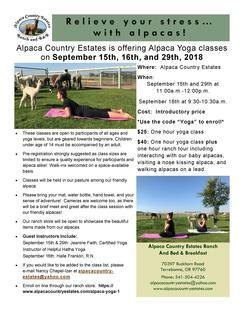 Featuring Designer Alpaca Clothing & Accessories, Quilts, Blankets, Throws, Yarns, Roving, Rugs, Toys, Souvenirs and Alpaca Yoga Classes. Please see our ranch website for our full list of products. 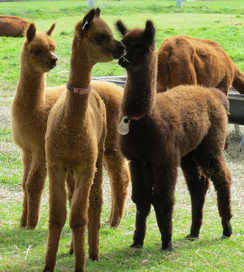 The decision of what to do with the many thousands of pounds of alpaca fiber resulted in creating a "fiber business" in addition to breeding top notch alpacas. When Nancy met an accomplished weaver and designer, it made perfect sense to combine the luxurious fleece of our 1,000+ alpacas with her creativity and experience, to turn "straw into gold," or in this case, fleece into Magical Strands. 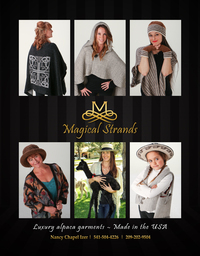 We began our fleece to fashion design company, Magical Strands, in 2014. With our expert staff, we make our breeding decisions, birth out babies, and select the best animals from our herd for their fiber. From this magnificent fiber, we create luscious, soft yarn, so we are able to bring to you one of the finest products of the North-West. 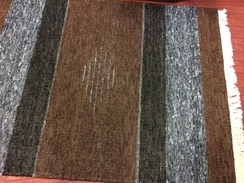 The weavers then create the designs and woven material from that fiber. We select alpacas of every color and use their natural tones/shades instead of dyeing for caramel, grey, chestnut, nutmeg and black. We do find that it is fun to add some colored flair with vibrant blues, magenta, amber, and jade to give garments that extraordinary pizzazz. 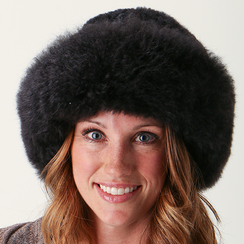 We offer a wide variety of luscious ponchos, coats, jackets, shawls, and scarves sold under the Magical Strands label. 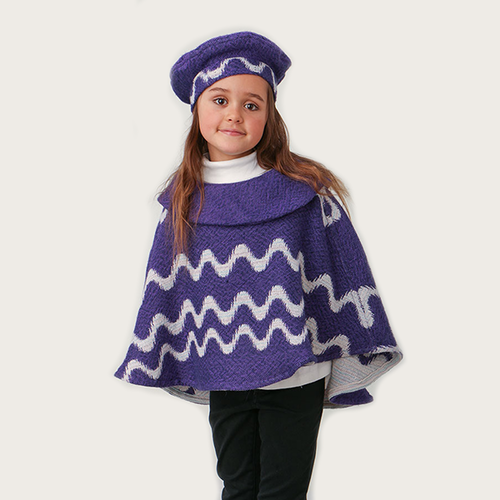 In 2017, Magical Strands also added knitted wear to their line; including blankets, ponchos, and scarves. Art’s varied background of many facets, plus his experience working with cattle and horses, has brought a new breath of fresh air to their ranch. Art began another facet for Magical Strands by making quilts and using alpaca fiber to fill the quilts for warmth and durability, while adding a high value to the unique quilts. His lovely one-of-a-kind quilts, ranging from baby size quilts to king size bed quilts, are sold in the boutique and on-line. 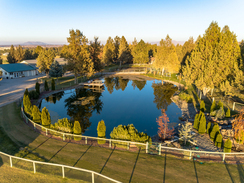 All of our products are made in the U.S.A., and sold on their new ranch website, as well as at their local ranch boutique located in Terrebonne, Oregon, and other upscale shops. We strive to bring you the best with reasonable costs/pricing. Our staff would take pride in creating a garment of your choosing in the future.